Big data and mobile technology are playing key roles in the recovery from stroke­-related language and cognitive impairment, according to an internal study conducted by ​Constant Therapy​, which provides a science-based, customized brain rehabilitation software program. ​After analyzing more than 20 million therapy exercises completed by users on its mobile platform, the company found that stroke patients who engage in at­-home therapy receive more therapy and experience greater improvement in both cognitive and speech accuracy and processing speed during their recovery. That same data, now available at scale, enables speech-­language pathologists and other healthcare clinicians to understand and predict what brain therapy exercises will be most effective for individual stroke patients. 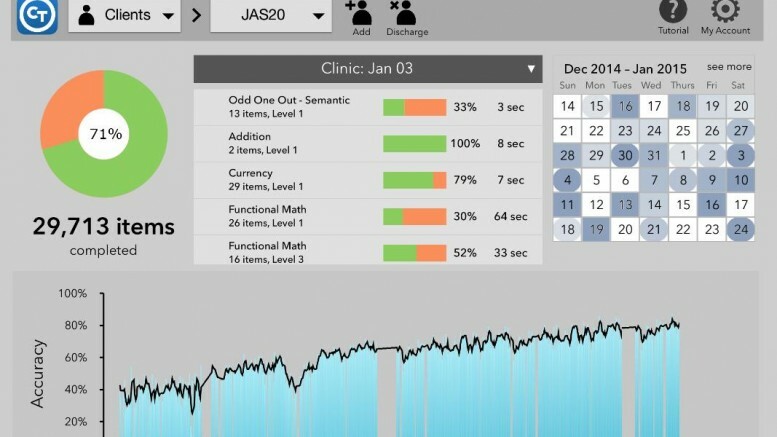 The company’s ​NeuroPerformance Engine™, an advanced analytics engine, ​analyzes patient performance and automatically personalizes therapy based on their specific performance and needs. Stroke survivors engaged in at-­home therapy receive 5 times more therapy than patients receiving in-­clinic therapy alone. Because therapy is available for use on an iPad, Android or Kindle tablet device, rehabilitation exercises that are assigned and practiced during an in­-clinic session can be continued at home. As the person continues to practice, a speech and language pathologist ­­— or the technology itself ­­— can advance an individual through a series of more challenging exercises to help improve memory, attention and speaking. To learn more about Constant Therapy or to download the application, which includes a 30­-day free trial, visit ​https://constanttherapy.com/signup/​.